Siblings can feel isolated and different from those around them. They may be unable to interact in the usualway with a brother or sister with Kabuki Syndrome. Their life often seems different from that of their friends.They may lack understanding and develop fears and worries. At home, they may be trying to be special, tobe noticed, to be valued.At school and in other social settings, they may be trying to be like everyone else, not to be different orstand out from the others. Most times it is difficult to talk to friends about what it is like to have a brother orsister with disabilities, as they feel their friends may not understand. Also it may be difficult to talk to parents– they may not want to bother parents who are dealing with other problems and they can feel guilty for complaining. This can lead to misunderstandings about the disability and fears that they have caused the disability orthat they too will develop special needs. They may struggle to explain the disability to others. It may be impossible to give and receive affection, play together and share other aspects of a sibling relationshipwith the child with special needs. There may be disappointment, frustration, fear or guilt, but at thesame time, intense sorrow for what their brother or sister is going through. Often siblings consider their feelings do not matter to the rest of the family. A child with a disability orchronic illness may require a huge amount of attention and energy from parents to ensure they get the necessarycare. As a result, young siblings can feel left out or even neglected. They often perceive the needsof a brother or sister as being more important. This can lead to difficulties in the bond between a primarycaregiver and a sibling, causing a child to lack confidence in that relationship and in their own self-worth. This builds up when family routines are disrupted and when the child with special needs is treated differently.Not only does the child with special needs receive more attention but sometimes he or she is allowedto behave in ways the sibling is not, eg. acting out or breaking family rules, and it all seems so unfair. Therecan be anger at the child with special needs and parents, but also at other people outside the family whosereactions cause a sibling to feel uncomfortable. Siblings may feel guilt because they do not have specialneeds (‘survivor guilt’). There can be guilt about their own successes when they see a brother or sisterstruggling with basic living; about typical sibling conflicts; and also shame about the negative feelings theyexperience toward a brother or sister. Siblings may feel they have to be perfect, to be successful. This may be because they are trying to gainattention or they may want to be the ‘good’ child, to not ‘make waves’, in order to protect parents from furtherdistress. They may worry about how parents are coping. They may also feel they need to achieve inacademics or sport to make up for the limitations of the child with special needs. Some children take on significant responsibilities. In some instances this can be very healthy, as childrendevelop skills and a strong sense of their own competence. It can really add to a child’s self esteem. However,sometimes these children feel they have no choice or they are attempting to appease the guilt theyfeel, or win parental attention or praise. In the process, they can miss out on the usual socialising activitiesof their peers. For some siblings, it can be difficult to participate in outside activities. It may be that parentsare too stretched for time or the special needs of a child may be too unpredictable for parents to feel able tofit in regular commitments like ballet classes, sport or music lessons. The child can feel huge conflict betweencaring for a sibling, feeling guilt and resenting missing such activities. Most siblings of a person with a disability will be able to say there were good and not so good aspects totheir experience. Those who can look back and see benefits in their situation say they have found inspirationthrough their brothers and sisters, become more tolerant, more compassionate, more aware of theirblessings and, in many ways, more mature than young people who have not had these experiences. Theysay growing up with their brother or sister gave true meaning to their lives, that “they made me who I am”. As mentioned earlier, many siblings are able to take very positive things from their experiences. They cangain inspiration, competence and independence leading to improved self esteem, and a range of humanqualities that add not only to their own life but also those around them. They often contribute to the communityin very useful ways. In terms of resilience, when children go through difficult experiences, are given support, and learn skills todeal with their difficulties, they are able, in fact, to become stronger adults.Some positive effects that can manifest in siblings, mentioned by families and practitioners, include: beingmore tolerant of differences, more compassionate, more reliable and responsible, high achieving. Manysiblings also go into helping professions, pride in brother or sister’s achievements, more insight, maturity.Support for siblings allows them to feel less isolated and it helps them build resilience. As a result, not onlyare they more likely to develop to their full potential, but also their relationship with a brother or sister withspecial needs is likely to be stronger. As parents, we are not able to, nor should we, shield our children from all life’s adversities. We can, however, take steps to minimize negative impacts. A certain amount of negative emotion on the part of siblings is very normal. The negative emotions themselves are not ‘wrong’. They can actually propel maturity and action. As parents, we must be willing to talk about them, to not necessarily wait for others in the family to approach the subject but to frequently initiate open discussion, both formally and informally. Each child in the family has needs that are separate from the child with Kabuki. It’s important we look for opportunities to spend with each child with undivided attention. Sometimes this means we need to schedule time for one-on-one opportunities, other times it may simply be taking advantage of spontaneous moments. Various cultures will have different viewpoints on who participates in the care for the individual with Kabuki in adulthood. Although as parents we hope that our other children will be involved, and in many cases, they want to remain involved, it should not be conveyed as an expectation. It is unrealistic and unfair to expect a sibling to take over the care of the person with the disability at the expense of their own life. It is important we don’t factor in this assumption when planning for the future of our child with Kabuki Syndrome. We allow our other children to have interests that do not necessarily include the child with Kabuki Syndrome. As parents we need to remember that our marriage comes first. Too often families become allconsumed with the child with special needs, and fail to nurture their marriages. A stress-filled relationship with one another will have a greater negative impact than dealing with disability. Ultimately, balance is the key. We invite and involve the siblings of the child with Kabuki to participate in the care, visits to hospital, etc, while at the same time we respect their feelings and recognize that their lives are uniquely their own. 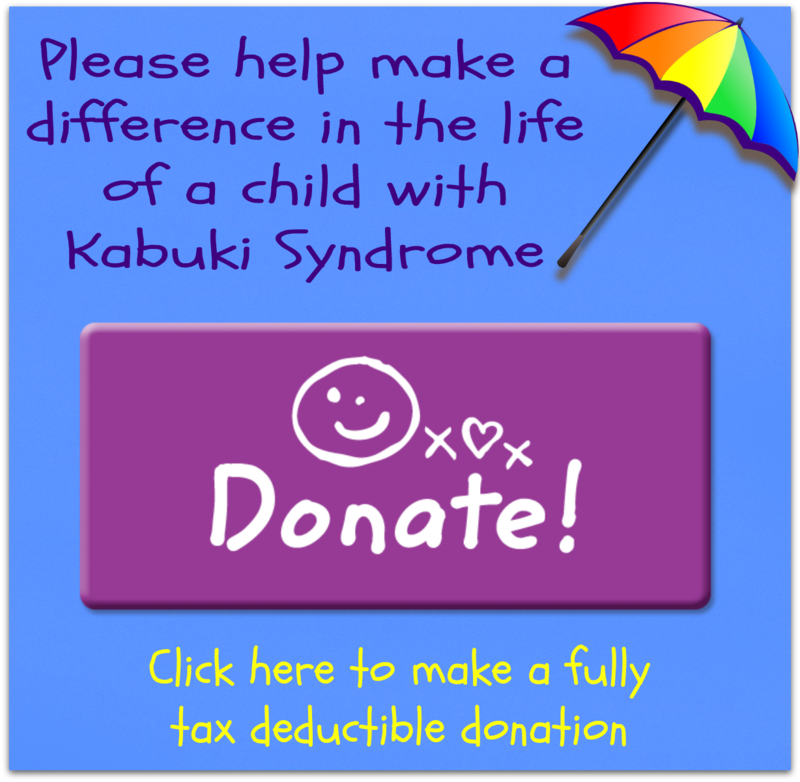 SAKKS SIBS: A support group for brothers and sisters who have a sibling with Kabuki syndrome can befound on the SAKKS website. This content is available in PDF format here.